DaliTV Box is an Android TV box being connected to DaliHub by Wi-Fi or Ethernet connection. It provides an interface for the user to control the luminaires and devices. The HDMI output of DaliTV Box is connected to the HDMI input of HDTV. By using the DaliTV remote control, the user can navigate to the desired button at the TV screen. After making the selection, the user presses the OK button to send out commands to DaliHub via the Wi-Fi router. There are two software modules at the screen, namely Lighting and Camera. The layout and functions of Lighting module are same as DaliPhone for ease to use. 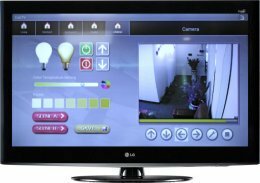 The Camera module allows the user to view visitors at the doorstep, and the video feed comes from an IP camera mounted at the doorstep. The IP camera is connected to the Wi-Fi router inside the house by local Wi-Fi network. The video feed can also be viewed remotely by using a mobile phone app based on P2P (Peer-to-Peer) technology, which is transmitted by the 4G LTE/3G/GSM mobile data network or public Wi-Fi hotspot. This remote feature is particularly helpful, when the user is away from home and wants to view visitors at the doorstep. Customization to DaliTV Box is available upon request, so as to suit the user's specific home theatre requirement. The control of luminaires, projector, and projection screen can be set into different scenes that are easily recalled by pressing one button at the remote control. When the user is in the basement, the video feed from an IP camera can let the user to show who is at the doorstep.